Classic Audax Bike for Sale. Willesden CC member Dan Duncan-Jones is looking to sell his impressive Roberts Audax 27″ frame. Dan bought the bike in 1989 (frame no. 8847) and it’s equipped with a Campagnolo Chorus triple, 10 speed, with a 29 sprocket on the back. The chain and cassette are new. The frame has been resprayed a couple of times and has always been put back together by the Bike Shop in North Harrow. 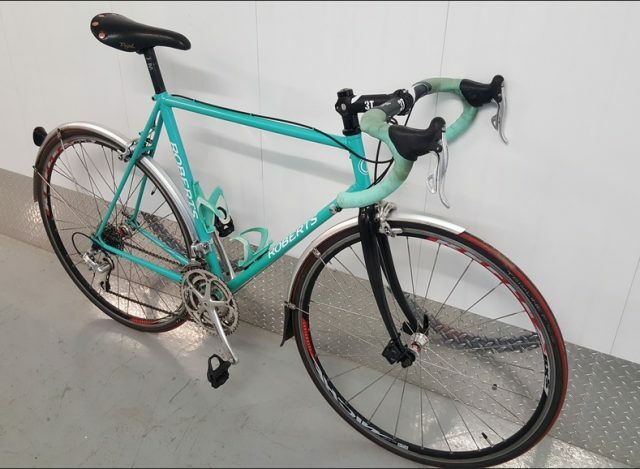 Dan say’s the bike is a reliable machine that can be used for either touring, commuting or as a training bike? It is on sale for £450. If you are interested then please contact Dan via the comments section below. This entry was posted in Audax, For Sale. Bookmark the permalink. 5 Responses to Classic Audax Bike for Sale. Nice looking bike. Is the frame size quoted correct – 27″ = 68cm… doesn’t look that big! Hi Paul – it was sold to me as being 57cm, but I’ll measure it and get back to you. Hi Paul – top tube measured from centre of head tube to centre of seat tube is 56cm. Frame measured from top of top tube to centre of bottom bracket is 56.50cm. Let me know if you want to see more photos. Hello Steve, I will forward your details on to Dan. If the bike is still available then he’ll be in contact with you.